Yes the three Cs. Celery, cucumber and cashew nuts can all come together and bring along another C that is chilly. Green chilly that is. This smoothie is so yummy I keep having for a week once I am reminded of it. 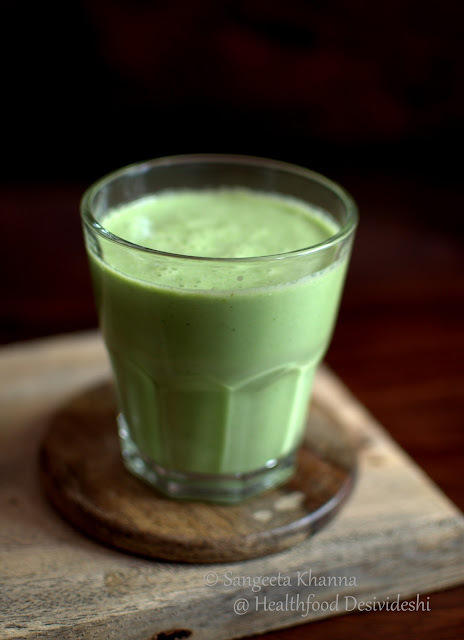 Otherwise a cucumber and coriander greens or mint buttermilk smoothie is a staple during hot summer months. Did you know green chilly prevents heat strokes? Yes it does. 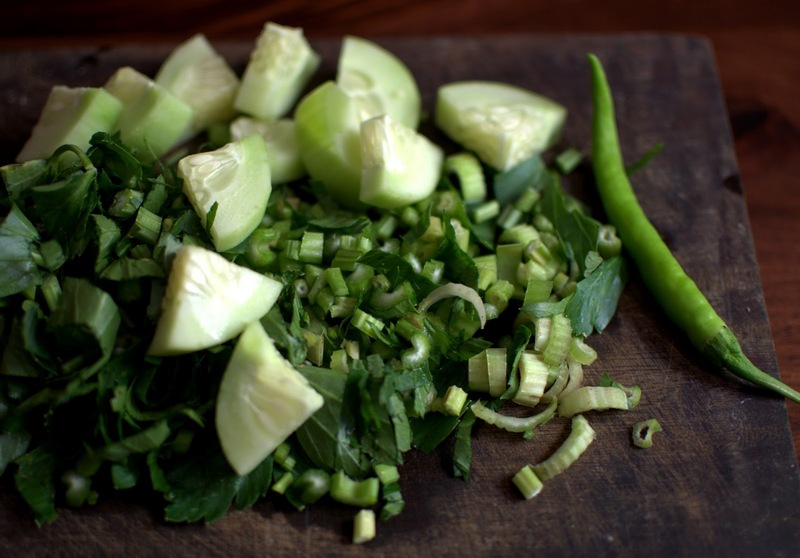 Even a small amount of green chilly, if consumed raw during summer months can prevent heat strokes and can keep the gut flora healthy as well. Can you imagine green chilies can be cooling and not 'hot'. Yes the heat comes form the ability of the capsaicin to accelerate blood circulation but this also cause more sweat glands to be active, more sweating and more cooling. Minerals found of green chilies are another good thing we need during summers. Do you still think ice creams, frozen yogurts and sorbets are the best cooling foods? Yes they are cooling if made using appropriate ingredients, but you tend to consume small amounts of frozen or chilled foods and the benefits get limited. The cold temperature of food being consumed doesn't make your body and system 'cool down'. It is the cooling type of ingredients like some herbs like mint, coriander greens, dill, celery etc, some watery vegetables and some spices like coriander, dill and fennel that cause cooling in the body. Yogurt is also cooling but buttermilk is supposed to be more cooling, thinner the buttermilk cooler it is according to Ayurveda. Removal of toxins by all excretory faculties of the body and scavenging of all free radicals by antioxidants in fresh ingredients goes a long way in actually cooling the system. See how I use mint with diluted yogurt and cucumber to make an instantly cooling smoothie for myself. Although the husband says it's more like drinking a raita but I insist it is different. A small bunch of mint leaves or coriander greens are liquidised along with home made yogurt, salt and pepper and sometimes a little roasted cumin powder and it makes a nice refreshing drink. This celery and cucumber smoothie is a way to use all my celery that is looking sad in hot sun. The outer leaves are plucked and chopped almost everyday and something or the other is stirred up. 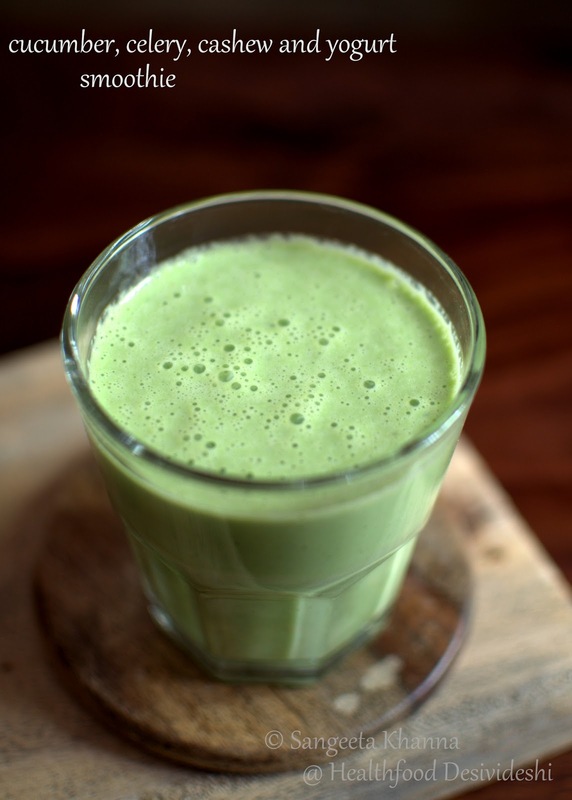 I loved how a green chilly brightened up this smoothie one day when I plucked a green chilly as well from the garden and liquidised with this. And green chilly is there in the smoothie since then. Half a cup packed of celery stalk and leaves, 3/4 cup of chopped cucumber and one green chilly if you wish, 1/4 cup of soaked broken cashew if I am feeling too hungry and a bit lesser if it's a normal day. I add rock salt to my smoothies as they are consumed raw and the minerals are bio-available. Blend everything together and pour the luscious drink into a nice glass. A refreshing cooling glass of green goodness. A meal in itself that keeps you full till lunch time. Oh deliciousness...all my fave ingredient in one glass. :) I have a feeling that I am going to love this one!! Refreshing smoothie.. very elegant shots too!! Sounds so interesting. Can I leave out the celery and keep the other ingredients intact or substitute it with some green onions? It's thanks to you that we've begun having buttermilk in many avatars every day. The green chili is definitely in there and offers a great kick to the cooler. I don't have celery else would have tried the 3 Cs for sure. That you for making my summer cooler. Big hugs! 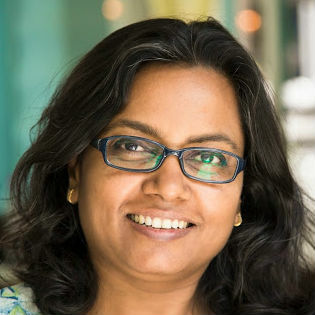 Hi Sangeeta, so good to hear from you. 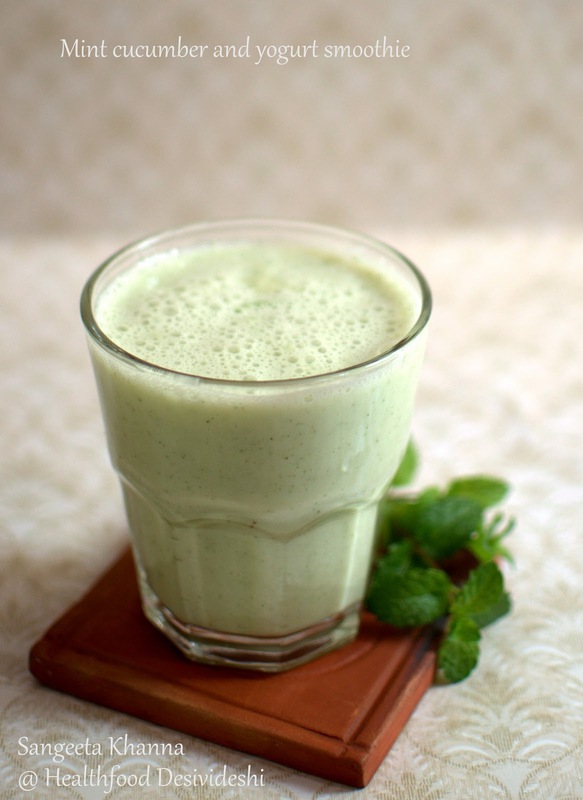 I don't think ice cream and other such things are cooling food at all, this is the yummiest smoothie with cucumber, mint and cashews. Love three C's. It was nice to hear from you after a long time. Love your three C's smoothie. 100% agree that its not the cold temperature of the food that makes our body feel 'cool' but the ingredients that are used in it. I find buttermilk the best cooler drink. This is such a healthy and refreshing smoothie! Perfect to drink after a workout....that is if I can get myself out to the gym first! hahaha...but, I drink smoothies all the time, regardless if I go to the gym or not. :P Thanks for sharing.